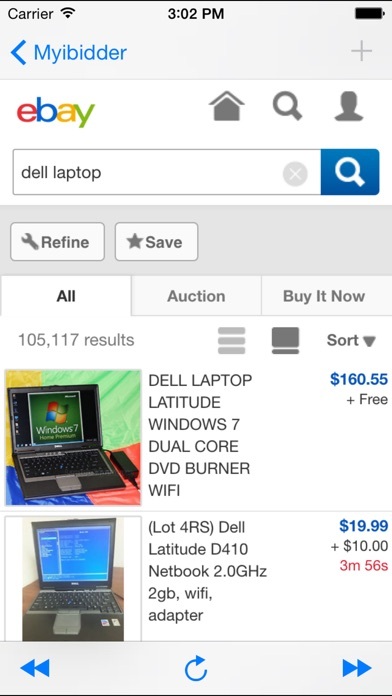 Are you avoiding buying on eBay because getting outbid too often? Make buying on eBay fun again! 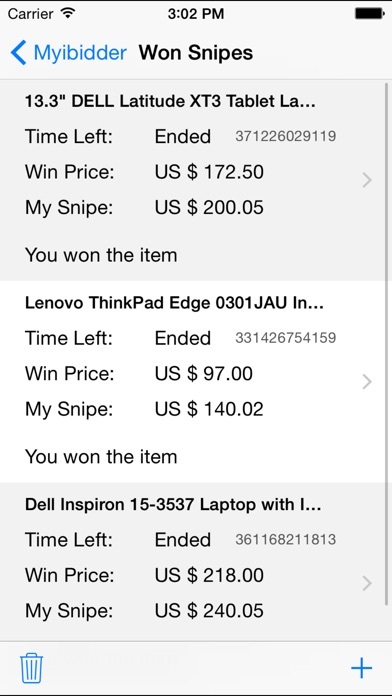 Myibidder Bid Sniper is a sniper for eBay buyers that places the last seconds bids to increase your chances to win. Finally it's here on the App Store bundled with 10 free snipes. No need to watch for auctions anymore, just set a snipe and let the sniper do the job for you. PPS means Pay Per Snipe. The app comes with 10 free snipes. 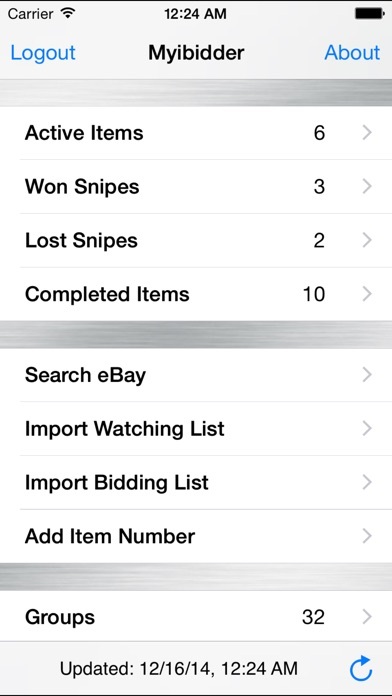 You can purchase additional snipes at any time directly from the app. We count won snipes only. All snipes less than 10 (USD, GBP, AUD) are free. When your balance is zero, you'll get one free snipe within 24 hours. The application uses Myibidder.com service (originally named Myibay.com) to place your snipes, so you can turn off or disconnect your phone after you scheduled your snipe. Currently, the service processes over 150,000 snipes weekly. Required to start: 1. Create an account for sniping from within the app or using https://www.myibidder.com/login/signup 2. 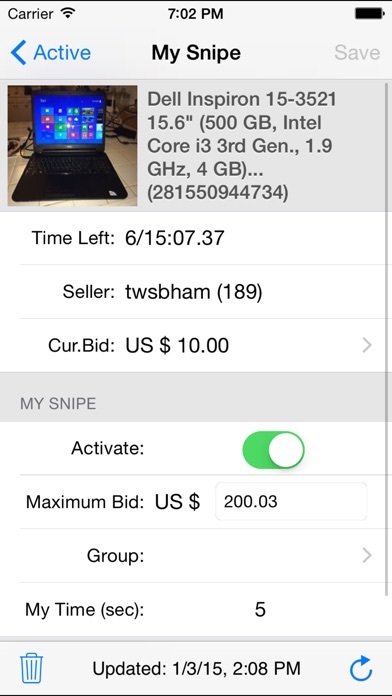 Link your eBay account to the sniper from within the app or using https://www.myibidder.com/main/ebay For those who never used eBay sniper in the past: 1. Sniping does not guarantee winning. You have to meet eBay's and seller's requirements in order to win. Make sure your snipe is ready (added & activated) at least 3 minutes in advance. 2. It will snipe the exact amount you set. If nobody bid higher, you will win at the lowest possible price just enough to outbid the previous bidder by one increment only. That means you have to set your absolute maximum when snipping. The default time of sniping is about 5 seconds. If you need to change it, you can enable "My Time" option in your device's Settings. 3. You can stop sniping if you have at least 1-2 minutes to go by setting "OFF" on "Activate" and saving your changes. 4. It's also technically not possible to show the current bid in real-time in the app. Tap "Refresh" icon to get the current status. 5. This is a sniper, not a monitoring tool. What it does -- it places your bids on last seconds. It does not do monitoring, alarm or send notifications in real time. 6. Groups is a feature to limit the number of items you want to win. When using Groups, please make sure the items are at least 1-2 minutes apart, otherwise you can win both. Quick instructions on how to get started: http://bit.ly/10DqJ7c Questions? Want to get answers? Please feel free to ask: http://www.myibidder.com/forums/ We are here to help. If you managed to read up to this point, please contact us with a short story on how excited you are, and we will credit your account with free snipes. Yes, that easy! The number of free snipes depends on the story. why wouldn’t you get this? I have been using this app for a few years. It’s given me many wins and I have become very reliable upon its application. I have absolute trust in its effectiveness. I’ve been using it for awhile. It definitely helps to snipe a bid when you just can’t, like some auctions end in the middle of the night due to time zone difference. I’ve used this for several years after another bidder app I’d used for years became flakey and unreliable. I don’t understand why people are having trouble with this app if they are using it properly, remembering to save after setting their bid. You don’t even have to be online for the bid to work. Set it and forget it. It has never failed me. I bought 50 bids, didn’t use the app for about year, and when I came back to ebay, my bids were still there waiting for me. Amazing! So I’m happy with it. Thanks for keeping it working. Sold me unlimited use. Now asking to pay per bid. There is plenty unlimited options. So I’ve won one or two auctions using this app and I’ve lost a couple of items that I should have won, but maybe my cell had bad reception at that moment. However now it won’t even log in saying I have an incorrect password. 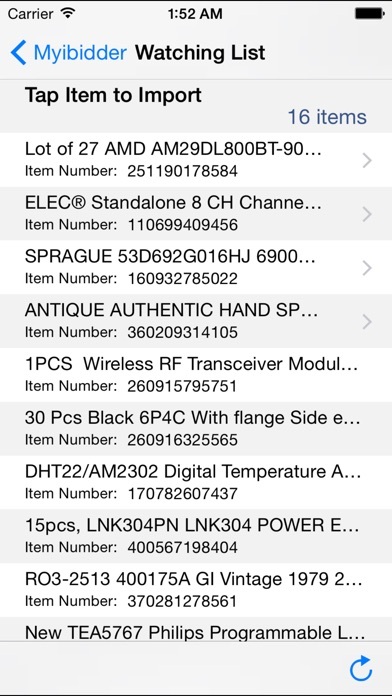 The password I’m using is saved by my phone and is used (successfully) to log in by my eBay app. Wish I hadn’t paid for this. If you change your eBay password you will no longer be able to log into this app. It will not recognize your new password, it will only recognize your old one even though eBay does not recognize the old one making the app useless. The developers have been told about this and they do not have any useful solutions other than creating a new eBay account. I’ve been using the same eBay account for 18 years and I do not plan on starting a new one just for this. I used this for years then suddenly it was no longer linked to my eBay account. I hadn't changed anything. I asked for help and was sent to a desktop version of the company site that did not allow me to sign-in. I still have bids left but can't use it. Looking for a new app now.